IntoductionPrehistoric archaeological research on the evolution of anatomically modern humans in southern Africa during the Late Pleistocene is increasingly becoming a multidisciplinary endeavour. How technological and socio-economic innovations are linked to hominin cognitive capacities during the so-called Middle Stone Age (MSA) are a major focus of current research. An important part of understanding the emergence, distribution and disappearance of these innovations is to understand regional social networks and demographic changes. The main aim of this geoarchaeological project - funded by the UoC Postdoc Grant - is to investigate both the relationship between discontinuous cultural occupation patterns and the regional climatic history at the juncture between Namib Desert and Great Escarpment in southwestern Namibia. 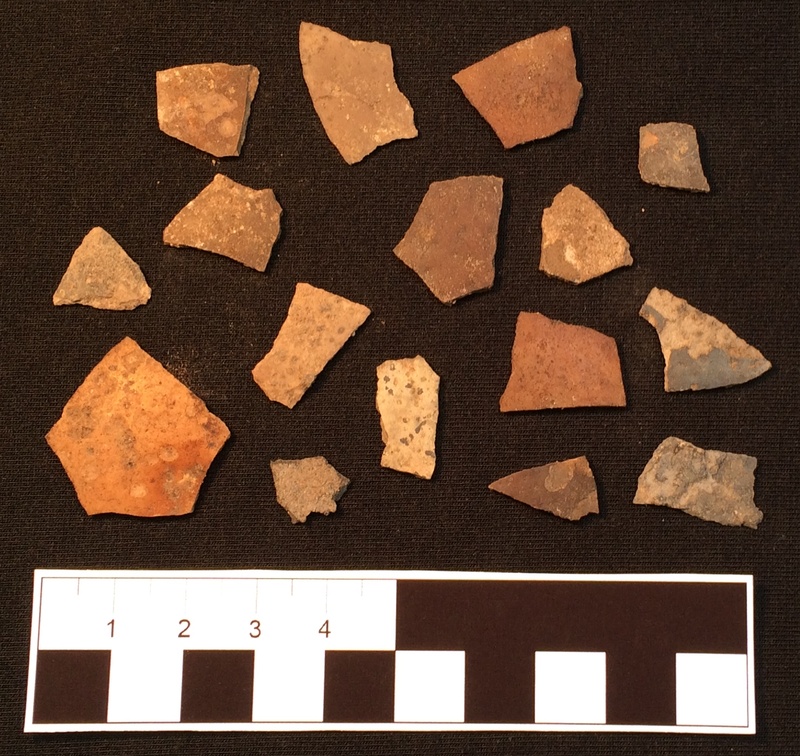 New data obtained by our reexcavation of the site of Pockenbank. Rock Shelter are set into regional and supra-regional contexts by applying a set of selected archaeological and geoarchaeological methods. The site Pockenbank is formed by a large rock shelter in a limestone wall. During a first test-pit excavation in 1969, Wolfgang Erich Wendt uncovered a complex stratified sediment accumulation. Later published by Vogelsang (1998), the sequence covers several phases of the Later Stone Age (LSA) and MSA occupations. The latter also includes the Howiesons Poort (HP) and possibly Still Bay (SB) technocomplexes, that are associated with hominin behavioural innovations in southern Africa. The site Apollo 11, some 80 km away, provides a good regional comparison due to similar archaeological material and composition of the cultural sequences. This project applies a wide range of archaeological and geoarchaeological analytical tools to ensure reliable and significant results detailed below. This approach investigates cultural and economic aspects during prehistoric procurement and use of lithic material. Innovations and traditions will be examined and compared to each other using new data with improved temporal and spatial resolution. 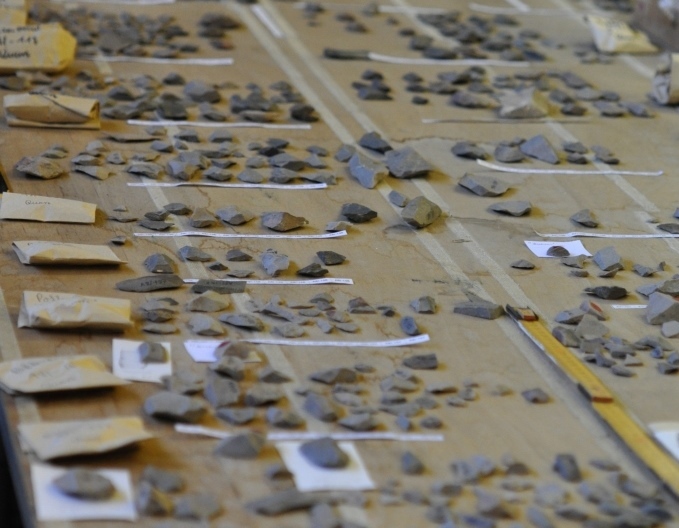 Petrographic analysis describes the raw materials which were used for lithic artefact production. By tracing original sources of the material, it provides information on (changing) mobility and land use patterns of prehistoric hunter-gatherer groups. AMS radiocarbon is used to date anthropogenic carbonaceous material (e.g. from hearths) in order to identify the moment and duration of human occupation. Samples with an age up to 50.000 years before present are datable. Apart from a more reliable regional chronology, we aim to obtain information onsettlement duration and intensity. Archaeological layers are often covered with younger sediments. OSL measures the time since the last exposure of quartz or feldspar to sunlight. This method extends the datable range up to 200.000 years before present. Field and laboratory analyses are used to characterize the mineralogical and organic composition and to reconstruct sedimentation geneses. It allows the minute description of a stratigraphic order. On-site and off-site archives are sampled. This method helps to clarify the sedimentary geneses and post-depositional processes at Pockenbank Rock Shelter. The microscopic examination of sediment thin sections aims to identify and describe soil forming processes and signs of anthropogenic, biogenic andgeogenic activities. The stable isotopes of carbon, nitrogen and oxygen from ostrich eggshells allow us to infer changes in relative amounts of precipitation and climatic conditions of the past. 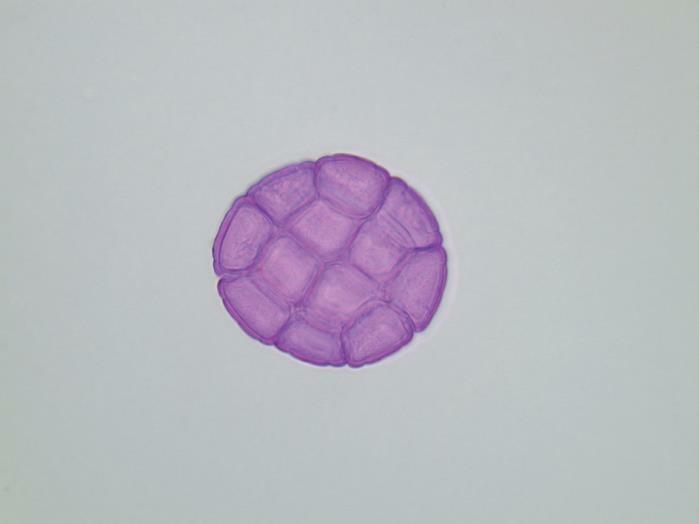 Palynology aims to identify the genera and/or species of pollen found in thesediments. 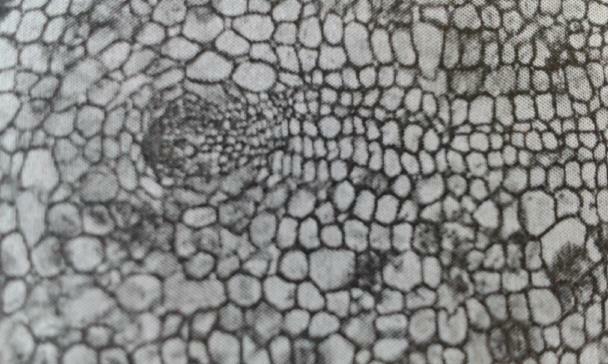 Their types and relative frequencies help to reconstruct thepalaeovegetation during the late Pleistocene. However, in arid areas pollen are rarely preserved. Digital terrain models and topographic maps are processed. Maps of current soil composition and distribution are combined with past and present climate data and archaeological information to reconstruct prehistoric landscapes. The re-excavation campaign was successfully completed in late May 2015. The prior excavation section of Wolfgang Erich Wendt was enlarged and a detailed study of the complex stratigraphic sequence was possible, including comprehensive sampling for the geoarchaeological methods. 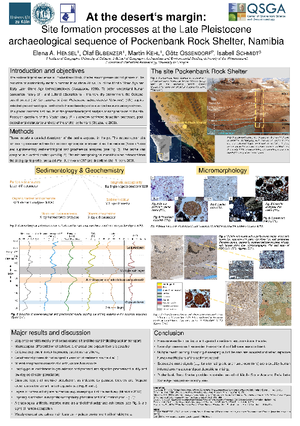 Analysis of sedimentology and micromorphology was conducted as a master's thesis (by Elena Hensel) at the Institute of Geography under the supervision of Dr. Martin Kehl and Prof. Olaf Bubenzer. Processing of further samples is currently underway. More information about the project and first results are available at Publications/Downloads. Schmidt I., Ossendorf, G., Hensel, E.A., Bubenzer, O., Eichhorn, B., Gessert, L., Gwasira, G., Henselowsky, F., Imalwa, E., Kehl, M., Rethemeyer, J., Röpke, A., Sealy, J., Stengel, I., Tusenius, M. (2016): New investigations at the Middle Stone Age site of Pockenbank Rockshelter, Namibia. Antiquity+ 90 (353). Hensel, E.A. 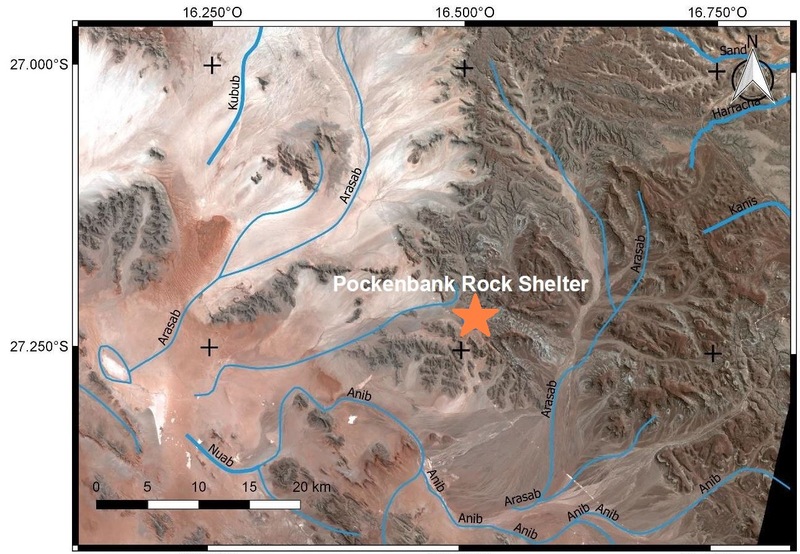 (2016): Geoarchäologische Untersuchungen zur Genese der Sedimentabfolge des Middle und Early Later Stone Age im Pockenbank Rock Shelter, Südwest Namibia. M. Sc. thesis: University of Cologne. Schmidt, I., Ossendorf, G., Bolten, A., Bubenzer, O. 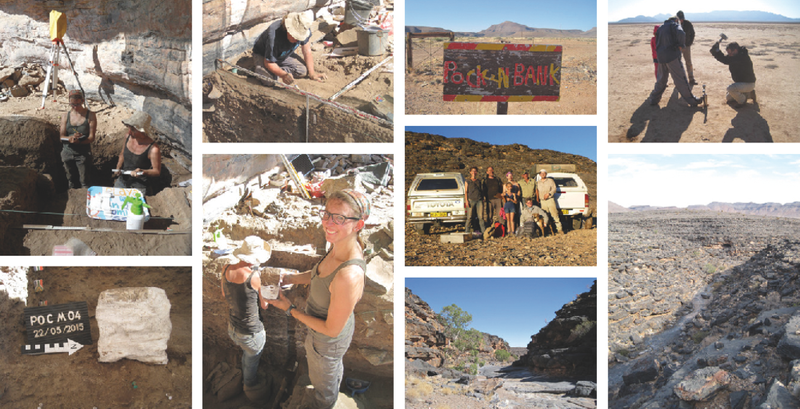 (2016): Human occupation in southern Namibia during the Late Pleistocene - A geoarchaeological approach. Quaternary International 404(B): 186-187. Ossendorf, G. (in press. 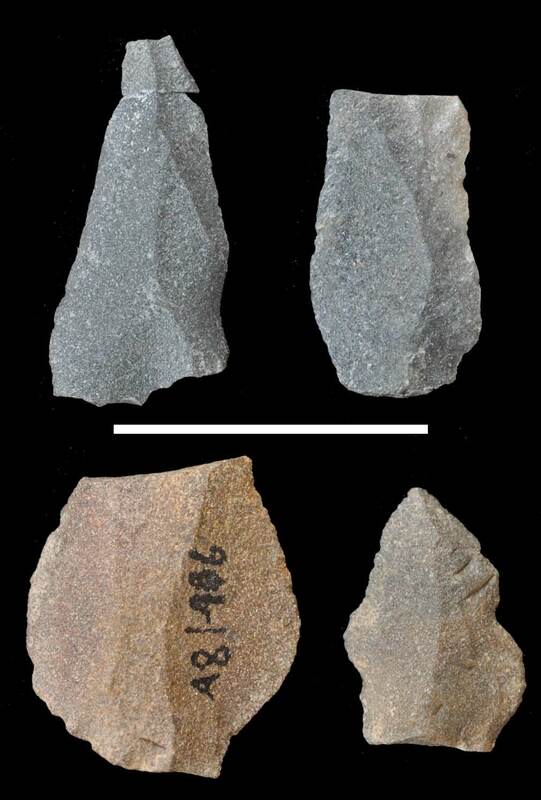 ): Technological analyses of Late Pleistocene Later Stone Age lithic assemblages from Apollo 11 rock shelter, ǀǀKaras region, south-western Namibia. South African Archaeological Bulletin 73 (205). Schmidt I. (2015): At the Margins of Late Pleistocene Subcontinental Networks - Interdisciplinary Investigation of the Cultural, Chronological and Environmental Sequence of Pockenbank, Namibia. Universität zu Köln: Forschung 2015-16, 52-53. Ossendorf, G. (2013): Spätpleistozäne Jäger-Sammler des südwestlichen Namibias. PhD dissertation: University of Cologne. Schmidt, I., Brill, D., Bubenzer, O., Hensel, E.A., Kehl, M., Ossendorf, G., Rethemeyer, J. (2016): Should I stay or should I go? 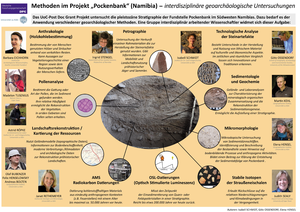 - Interdisciplinary study of occupation discontinuity at Pockenbank Rock Shelter (south-western Namibia) during the Late Pleistocene; Presentation at the 23rd biennial SAfA meeting, Society of Africanist Archaeologists, Toulouse, France. Hensel, E.A., Kehl, M., Ossendorf, G., Schmidt, I. (2016): The Late Pleistocene archaeological sequence at Pockenbank Rock Shelter, Namibia: First insights into site formation processes; 23rd biennial SAfA meeting, Society of Africanist Archaeologists, Toulouse, France. Hensel, E.A., Bubenzer, O., Kehl, M., Ossendorf, G., Schmidt, I. 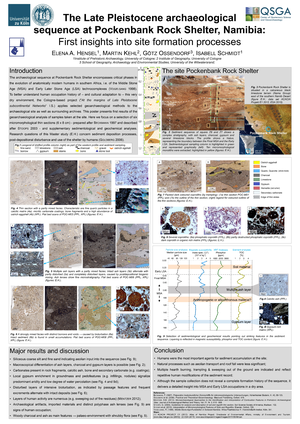 (2016): At the desert's margin: Site formation processes at the Late Pleistocene archaeological sequence of Pockenbank Rock Shelter; Inside-Outside-Workshop: Integrating Cave and Open-Air Archives, Köln, Germany 2016. Hensel, E.A., Bubenzer, O., Kehl, M., Schmidt I. 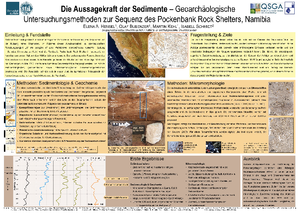 (2015): Die Aussagekraft der Sedimente - Geoarchäologische Untersuchungsmethoden zur Sequenz des Pockenbank Rock Shelters, Namibia; Jahrestagung Geographischer Arbeitskreis Subsaharisches Afrika (AKSA), Köln, Germany, 2015. Henselowsky, F., Bolten, A., Bubenzer, O., Ossendorf, G., Pflüger, O., Schmidt, I., Stengel, I. 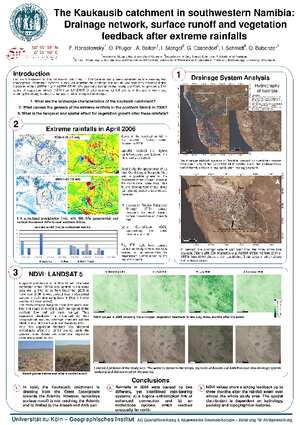 (2015): The Kaukausib catchment in southwestern Namibia: Drainage network, surface runoff and vegetation feedback after extreme rainfalls; Jahrestagung Geographischer Arbeitskreis Subsaharisches Afrika (AKSA), Köln, Germany, 2015. Schmidt, I., Bolten, A., Bubenzer, O., Eichhorn, B., Gwasira, G., Hensel, E.A., Henselowsky, F., Kehl, M., Ossendorf, G., Rethemeyer, J., Sealy, J., Stengel, I., Tusenius, M. (2015): Late Pleistocene hunter-gatherer networks: Subcontinental or regional expressions? - Interdisciplinary geoarchaeological investigations in south-western Namibia; XIX Congress International Union for Quaternary Research (INQUA), Nagoya, Japan, 2015. Schmidt, I., Bolten, A., Bubenzer, O., Eichhorn, B., Hensel, E.A., Henselowsky, F., Kehl, M., Ossendorf, G., Rethemeyer, J., Röpke, A., Sealy, J., Stengel, I., Tusenius, M. (2015): Methoden im Projekt "Pockenbank" (Namibia) - Interdisziplinäre geoarchäologische Untersuchungen; Tag der Forschung, Neanderthal Museum, Mettmann, Germany, 2015. Schmidt, I., Ossendorf, G., Bolten, A., Bubenzer, O. 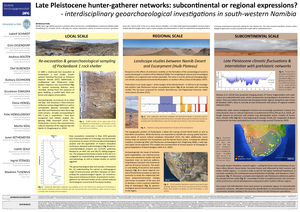 (2015): Human occupation in southern Namibia during the Late Pleistocene - A geoarchaeological approach; Presentation at the AfQUA Conference, University of Cape Town, 2015. The project is financed by a Postdoc Research Grant of the University of Cologne awarded to I. Schmidt. We thank the National Museum of Namibia for hosting material and research, the National Heritage Council of Namibia for supporting the project, and the African Research Unit, University of Cologne, for providing research facilities. The project benefited from help and assistance of Werner Schuck, Nora Jansen, Charlie & Helga Goodwin, Helmut Paffrath, Joel Orrin, Sylviane Scharl, Ralf Vogelsang, Wei Chu, Thomas Wolter (all University of Cologne), Karim Sadr (University of the Witwatersrand), Jill & John Kinahan (Quaternary Research Services), Dieter Noli (Namdeb), Jayson Orton (ASHA Consulting) and Beatrice Sandelowsky (The University Centre for Studies in Namibia). Special thanks to Lothar, Melli and Mette Gessert for the great hospitality and support during fieldwork!